Straight outa Norwich U.K., the Bevis family including dad Ricky (Nick Frost), mom Julia (Lena Headey), brother Zak (Jack Lowden) and daughter Saraya (Florence Pugh) are a family that make their living putting on adrenaline filled semi-pro wrestling matches. Set on hitting the big time and making it to the WWE both Zak and Saraya bring it to the mat, but only Saraya will move on. With the WWE Saraya will transition to become the diva phenom known as Paige, but at what cost? Written and Directed by Stephen Merchant and based the actual story of the Bevis family of Norwich, this endearing tale of thrills chills and spills brings hope and aims to lift up where Aronofsky’s The Wrestler (2008) casts a darker shadow. Told with spit, grit, and muscle, Merchant’s wit and direction keeps this merry cast of miscreants perfectly balanced on the brink between pile driver and scorpion death lock, that is to say the laughs come just as easily as the cringe and wince worthy moments. 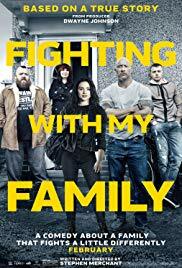 Well played from the top ropes, Fighting with My Family is rated PG-13. With years of co-existence between humans and dragons in the land of Burk a new threat moves to the forefront, the arrival of the tyrannical Grimmel (F. Murray Abraham), a dragon slayer bent on killing all of the Night Furies in existence. Threatened, Chief Hiccup (Jay Baruchel) motions to move the dragons to the mythic and legendary Hidden World. On the move the Burkians will be at a disadvantage, will they ever find the hidden world, or will they lose their dragons once and for all? Directed by Dean DeBlois and written by DeBlois and Cressida Cowell this animated smorgasbord feast brings the crispest and most challenging textures to life in stunning beauty matched by an entertaining narrative, which, while not challenging in any regard still provides for a positive and empowering family friendly rollicking good time. And, with talented cast that includes Cate Blanchett, Gerard Butler, America Ferrera, Craig Ferguson, Jonah Hill, Christopher Mintz-Plasse, and Kristen Wiig, the laughs and chuckles come easy enough. 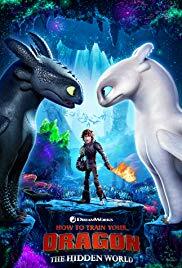 A family friendly matinee seems in order here, How to Train Your Dragon: The Hidden World is rated PG. 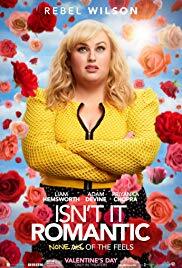 Disenchanted by love, Natalie (Rebel Wilson), finds herself trapped in what appears to be a PG-13 musical romantic comedy, the lesser known ring of hell in Dante’s Inferno. How to make sense of it all, and, getting herself back on par will take extra effort in order to find a happy ending. Directed by Todd Strauss-Schulson, and written by Erin Cardillo, Dana Fox, and Kate Silberman, this light hearted send up of all things romantic comedy deconstructs all that is ridiculous and hilarious about the genre, essentially the anti rom-com that conveniently turns into a rom-com, and that’s okay. Is this high brow cinema, not a chance, sometimes cheap thrills really are just what the doctor ordered; to that end, Wilson and co-stars Liam Hemsworth, Adam Devine, and Priyanka Chopra, are delightfully quirky, disarming, and charismatic. Simple fun date material that everyone can enjoy, Isn’t It Romantic is rated PG-13.